Bud Selmi has worked in the Mount Washington Valley for more than 40 years. A Certified Chef through the American Culinary Federation, he also works closely with the ACF’s NH Chapter’s Junior Program. In 1999, Chef Bud was named Chef of the Year by the ACF’s White Mountain Chapter. He is also the owner of Sizzlin Sauces, an award-winning line of sauces and marinades. Margarita Grill in Glen opened in 1983, serving Southwestern-inspired cuisine. The restaurant is known for its own salsas and flavor enhancers. The restaurant is a NH Farm to Table Certified Restaurant that also is big in the green movement, using biodegradable takeout containers and actively reducing fuel, water and electricity. Dredge fish in blacken spice, and heat olive oil in a large saute pan or skillet. Place fish into hot pan, and saute for approximately 2 minutes per side until cooked through. Add a dab of tartar sauce to each warmed tortilla. Place cooked fish in taco. Top with arugula, tomato, onion and cheese. Drizzle tacos with Honey Habanero Sauce (best practice: place Honey Habenero in a squirt bottle to drizzle on top of tacos). Mix all ingredients, and keep in a sealed jar for use with your fish. Mix all ingredients together and place into a squirt bottle for easy application. Chef Bud will be appearing live on WMUR Cook’s Corner on April 29th. Chef Bud from Margarita Grill in Glen NH was chosen as one of 10 Celebrity Chefs to sponsor NH Restaurant Week in May. Chef Bud will be preparing our famous Bayou Seafood Quesadilla inspired by Louisiana style cooking. The dish will feature some of Chef Bud’s Award Winning Sauces. 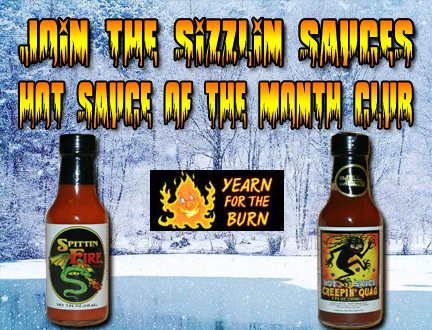 With 54 National Awards Sizzlin Sauces has earned the status ofAmerica’s #1 Award Winning Sauces. Margarita Grill features Sizzlin Sauces in their restaurant and utilizes Sizzlin Sauces in some of their menu items as well as incorporating the sauces in their daily Award Winning Specials. Margarita Grill features dynamic south western cuisine and has just recently been awarded both Environmental Champions by NHSLRP and also have achieved the distinction of a Certified NH Farm to Table Restaurant. Join us for absolutely some of the best south western cuisine in theNorth Country. Mix all ingredients, refrigerate over night! 1. Mix Ground Beef, Diced Onion, Fresh Parsley, Shredded Parmesan, Bread Crumbs, Eggs, Tomato Sauce, Salt & Pepper and Papa Jack’s Hot Sauce. 8. Seal the ends of loaf by folding under.